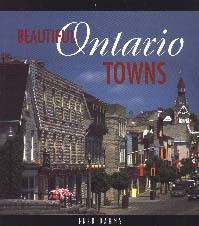 CM Magazine: Beautiful Ontario Towns. Toronto, ON: James Lorimer, 2001. In Beautiful Ontario Towns, Fred Dahms explores the recent popularity and economic growth of ten Southwestern Ontario towns in relation to geography, geology, and history. He based his selection of towns upon the following criteria: "Each had to be within a two-hour drive of the major cities of Southern Ontario. None were to have a population over ten thousand, and none were to be swamped by creeping urbanization. The architecture of each community had to reflect local geology and building materials. All had to be appealing to visitors and to those who might wish to move to them permanently. The selection needed to reflect the diversity and complexity of Ontario's beautiful rural communities. Local economies had to be healthy and attractive to potential migrants. All needed to be engaging, prosperous places with friendly residents and helpful merchants." The following places were finally chosen: Creemore, Dunnville, Elora, Fergus, Meaford, Neustadt, Paisley, St. Jacbos, St. Marys and Thornbury. In or near these communities you will discover crafts, breweries, fine dining, historic limestone architecture, sandy beaches, and outstanding fishing, skiing, hiking and caving. Like most Ontario settlements, all began at dam sights providing power for sawmills and gristmills. In many, these early industrial buildings have been recycled into trendy shops or restaurants. In some, local culture dominates, while elsewhere, entrepreneurial activity has transformed the character of the towns. Many offer historic properties and new homes at prices far lower than any in the city. All provide pleasure and stimulation for the day-tripper or shopper, and affordable properties for those seeking a home away from the city. 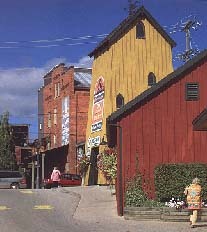 The book's table of contents lists the towns in alphabetical order, assigning to each a label that points to the influences of geography/geology upon its economic development (e.g., "Dunnville: River Town," or "Elora: Mill Town"). The arrangement of the contents provides the first indication of Dahms' methodical and measured approach to his subject, which is reinforced by the format of the subsequent chapters. A full-page color photograph begins each chapter, and a map one-third of a page in size appears directly opposite, depicting a town's street layout and special points of interest. A similar structure underlies each chapter: the book allots exactly six pages apiece to each of the ten towns, and information about each town is organized into categories including its "Early History," a profile of its founder or first settler, and an observation regarding its "Contemporary Character." While, on the one hand, this strategy conceals any favoritism the author may harbor towards any particular town or towns, on the other hand, it comes across as a bit too formulaic a read at times. Since Dahms frequently compares or contrasts one town with another, the full-page color map of Southern Ontario that precedes the "Introduction" is a helpful aid that establishes the larger context for readers unfamiliar with Ontario's geography. The maps are not the only visuals in the book, however; vivid color photographs grace the majority of pages, amply demonstrating Dahms' pursuit of the "beautiful" in these rural regions. The clarity of detail in the photographs is outstanding. Especially fascinating is the "The Elora Gorge" photo on p. 26 which contrasts smooth river with sharp rock, both enveloped in a green froth of foliage. Although the book's content clearly evinces Dahms' expertise on rural Ontario, the style and tone it adopts border on nondescript: the pictures overpower the predictable hum of the prose (a result, for the most part, of unvaried sentence structure). Neverthless, Beautiful Ontario Towns would make an excellent starting point for students engaged in high school history/geography/economics projects on Southwestern Ontario, given its two generous appendices as well as its "Selected References." For instance, Appendix A, which is eight pages in length - a chapter in its own right - delves into Ontario history and reflects upon the evolution of rural towns from centres of agricultural importance to communities for retirement and retreat. Appendix B offers statistics pertaining to population, employment, medical and recreational facilities, churches, libraries, and Web sites. Ultimately, what Beautiful Ontario Towns lacks in stylistic elegance, it offsets with its wealth of information and its visual appeal. Julie Chychota hopes to visit some of these "beautiful Ontario towns" in the not-too-distant future, given her recent relocation to Ottawa from Winnipeg, MB.